Affiliates are our partners. Affiliates share in the profits from the revenue generated by the customers they refer to us. We provide Affiliates with considerable marketing materials and resources to reach the highest conversion rates from promotion of PsychicOz.com. Affiliate Managers work with Affiliates to maximize revenues and assist in any way necessary. How can I become a PsychicOz.com Affiliate? Click here to sign up as a PsychicOz Affiliate. The process takes only a few minutes. After we accept your registration, you can start using our marketing tools on your website to start drawing traffic to PsychicOz.com. If I forget my Username/Password, can I retrieve it? Yes. Click here and we will email a password reminder. Are there PPC advertising restrictions? Except for our brand name which is “PsychicOz.com” or “PsychicOz”, you may use any keyword for PPC advertising on any network. You may use “PsychicOz.com” or “PsychicOz”as a meta keyword. What does it cost to become a PsychicOz.com Affiliate? It’s completely free to become a PsychicOz.com Affiliate. There is no set-up fee and there are no ongoing charges. You can generate more revenue from your site by simply adding PsychicOz.com marketing tools. How much can PsychicOz.com Affiliates earn? There’s no limit! We don’t cap how much Affiliates can earn by sending clients to PsychicOz.com. We give Affiliates a flat rate of $100 for a new paying customer you direct to us. We pay our Affiliates their commissions monthly! What is your minimum payout amount? $100 is our minimum payout threshold. You need to earn $100 or more to get paid. Are there requirements to register as a PsychicOz.com Affiliate? All you need is a website, valid paypal email (for payments) and there is no charge to register. You may send visitors our way any way you want. But always respect the privacy of others, and do not spam. Affiliates who spam will immediately be expelled from our Affiliate program. We also have a zero-tolerance policy on spyware and adware. Sending traffic to our sites through spyware or adware is strictly prohibited. Accounts of Affiliates using these methods to promote our site will immediately be suspended, and all payouts will be forfeited. Affiliate webmasters may not use “PsychicOz.com” or “PsychicOz” as a PPC keyword in any PPC network like Google Ads. If I live outside the U.S., can I still become an Affiliate? Yes! PsychicOz.com accepts Affiliates from all over the world. Can PsychicOz.com Affiliates link to other website? Yes! There are no restrictions on other content on your site. But you will reach the best conversion rate by prominently placing promotional materials. What does PsychicOz.com consider to be spam? Spam is abusing electronic messaging systems to send bulk undesired, unsolicited messages. Email spam is the most widely recognized form of spam. PsychicOz.com Affiliates are required to refrain from such actions. Can I refer Psychics and Affiliates to the PsychicOz.com Affiliates program? It will be available soon. Please stay in touch. What rules govern your $100 Commission/CPA plan? Visitors sent by Affiliates with CPA plan must purchase credits for $101 or more for the Affiliate to receive the $100 CPA plan payout. They also must be new clients for PsychicOz.com. What are PsychicOz.com's payment options? Currently, we only pay our affiliate by PayPal. Affiliates must insure that they provide us the correct PayPal email. Be sure the information in your account panel is correct and current, and correct it if necessary. When this is done, contact us so we can track your payment. Your earnings for the next payment period will be sent once you reach the minimum payment amount in that payment period. The payment date in a month is the 15th day of the following month. Log in to your Affiliates account and click on the Reports tab and then on the Commisions button. We require a valid e-mail address to keep in touch with our Affiliates. Please confirm the email address used at registration. We keep e-mail addresses confidential and won’t abuse them in any way. We do not sell emails or give them out to other companies or third-party organizations. This strict confidentiality policy applies to all information shared with us at registration, including banking information, name, address, and so on. What marketing tools are available to Affiliates? We offer our Affiliates a wide variety of marketing tools: banners, link codes etc. We constantly expand our list of marketing tools available, so please check back often to discover new releases. And contact us if you have suggestions! Do you have requirements where PsychicOz.com Affiliate ads must be placed? No. There are no specifications where ads must be placed. But to maximize your earnings, it’s advisable to place marketing tools in a prominent location. For placement advice, contact an Affiliate Marketing Managers via support ticket. They’ll work with you to find the optimal solution for you. We don’t allow Affiliates to use “PsychicOz.com” or “PsychicOz” as a PPC keyword. Can we exchange banners or links? No. PsychicOz.com does not exchange links. We don’t display ads on our site. I have an idea to increase my Affiliate income. Who can I talk to? We’re always open to new ideas! Submit a support ticket, or email an Affiliate Marketing Manager. They’ll work with you to implement your idea. Can I direct traffic to a specific page on PsychicOz.com? Yes. You can use text links, found in your marketing tools, to direct traffic to a specific page or a psychic profile page on PsychicOz.com. I have multiple websites. Do I need multiple Affiliate accounts? No. You can and should use only a single Affiliate account to direct traffic from multiple sites. I have multiple email addresses. Can I send emails from those addresses to promote your site? We don’t allow spam and do not affiliate with such practices. Don’t spam others to promote our site. If your site members agreed to receive emails, and you’d like to promote our services to them, you may occasionally send them emails. But please consult us before beginning a coordinated promotion via email. Does your market match ours? We might make perfect partners. Our target demographic is women and men between the ages of 25 and 55 who are well-educated professionals employed outside the home. They all have questions about relationships, love, romance and their careers. Just use this contact form please. Where do I see my affiliate link? 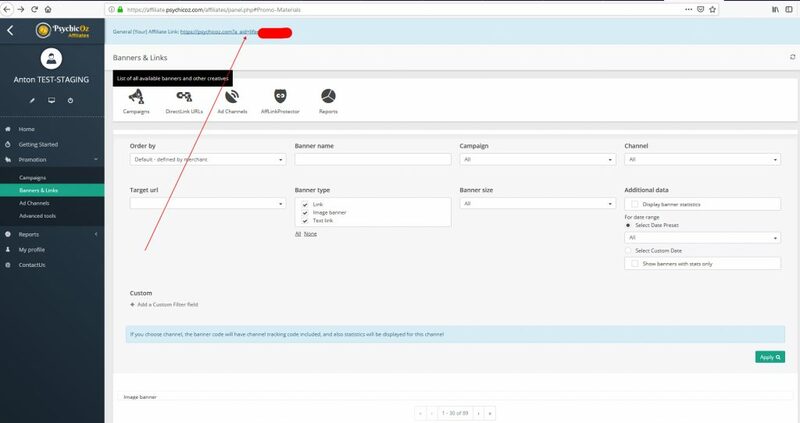 You can see you general affiliate link on top left corner of your affiliate home page. Can I send traffic to any page of your website? Still do not see answer to your question? Contact us!